Born and trained as a product designer in Russia, photographer Konstantin Sutyagin moved to Los Angeles in 1999. There, he has worked as a graphic designer and, most recently, as a photographer. He submits his work to no fewer than seven different microstock companies. I have mixed emotions about microstock, but to ignore it as a business model is rather like having your head stuck in the sand. Or someplace worse. Sutyagin's photos caught my eye in the Strobist pool almost immediately. He is clearly getting past the idea of merely making good light, and has moved on to injecting a personal vision into his photography. Pause for a moment to consider how that must have felt to a young, Russian-born photog, to see his photo amplified like that, along with only his name and that of his adopted country next to it. Sutyagin got the idea for the photo series when an artist/model/friend showed up with a new beard. He was amazed at how much his friend looked like the traditional depiction of Jesus. 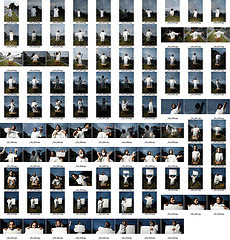 Fortunately, Sutyagin posted a contact sheet of the shoot, (click the pic for larger view) so you can easily watch the progression yourself. He likens the creative process for content to the one we like to use for zeroing in our light: Shoot, chimp, adjust, shoot, move, chimp, adjust, etc. He considers each photo to have three elements: Subject, background and lighting. He prefers twilight for it's drama and ease of balancing with the light from a small flash. He started shooting this shot with direct flash, then moved his Canon 420EX off-camera and into an umbrella. Finally he added a Vivitar 285HV for a backlight. The latter makes the photo, IMO. It not only rim lights the model's head but also backlights the robe, almost making an internally glowing look. So many people get so excited the first time they off-camera flash into a twilight sky (granted, it is a huge improvement) that they fail to take the next step and define or separate their subject with a second light. Do yourself a favor and don't shortchange yourself by using just one light. He moved a little to the right to include a setup shot (boy, was he shooting with me in mind, or what) to show just how simple and sparse his lighting gear really was. Not a lot of money here. Note that he is only using one umbrella and one stand, total. Gotta love those voice-activated light stands. But what about the final photo itself? The concept is as flexible as the execution is sharp. Sutyagin himself has been surprised at the layers that people extract from the photo. Speaking for myself, I can see two visually aware, devout Christians looking at the photo, with one seeing it as blasphemous and the other seeing it as a telling comment on the shallowness of the ready-made quality of some modern churches. That is the beauty of the photograph, really. What you see in it says more about you than it says about the photo. And as a stock photo, the conceptual uses for it are as varied as the people who will view it. In short, Sutyagin has shown himself to be a thinking stock photographer. So what are his plans going forward (besides read Strobist on a daily basis, I mean?) He sees himself continuing to build his stock portfolio, shooting friends in Los Angeles. But next week he heads back to Russia for a month, where he will be shooting heavily, concentrating on portraits. You can see more of his work on his Flickr Stream, or at his website, www.cool-photos.com. Or you can email him at info[~at~]cool-photos[~dot~]com. Some of his stock photo libraries include these at LuckyOliver, ShutterStock and iStockPhoto.